In this edition of Random Thoughts from the Humidor, I ponder the proper way to let a cigar die, a method to repair wrapper damage, and beetle season. We’ve all read—and probably also heard it said—that you should never stub out your finished cigar. 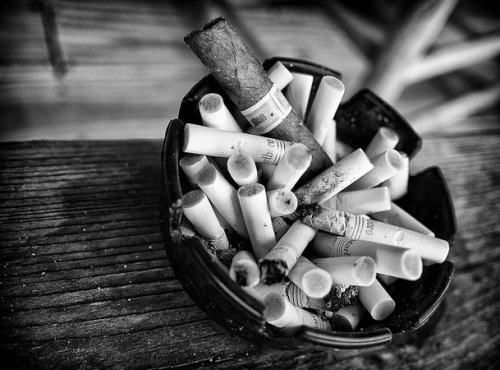 Rather, you should simply let the cigar rest in an ashtray until it has extinguished itself from a lack of puffing. The reasoning behind this, it is said, is that mashing the cigar like a cigarette will produce a stale odor, and the practice is therefore impolite. Perhaps there’s a chemical justification for this policy. I’m not sure. But I decided to do my own personal experiment (albeit with a small sample size) and found that, yes, on the margin, cigars that are stubbed tend to produce a slightly foul odor, whereas cigars that breath their last breaths on their own tend to smell much as they did when they were fully lit. The difference, however, is usually negligible. That said, I never like to stub out my cigars regardless. I just don’t like to see a hand-crafted work of art get crushed into oblivion. I like to think each well-made cigar deserves an honorable death. As much as we try to avoid it, sometimes a cigar’s wrapper will tear or crack, or the seam will start to unravel a bit. Sometimes this is the result of shipping damage. Sometimes (frustratingly) it occurs when you remove the band while smoking. Sometimes it’s the result of poor storage. Whatever the reason, wrapper damage is going to happen from time to time. If you’re lucky—and if the tear is small—a little saliva could do the trick. If not, you may want to try more drastic measures. For these situations, keep a little pectin or vegetable glue on hand. This is the same non-toxic stuff cigar makers use to glue the bands on their cigars. Having some may mean the difference between smokable and non-smokable. Temperatures are warming up across most of the country. For cigar smokers, that means it should be a little easier to maintain humidor humidity. But it also means temperature needs to be monitored in order to prevent an outbreak of the dreaded tobacco beetle. Remember: High temperatures, particularly those above 75 degrees Fahrenheit, are conducive to eggs hatching, so keeping your humidors below 70 degrees. The best way to deal with tobacco beetles is to prevent them in the first place. If you’re unfortunate enough to experience an outbreak, you can read our materials on how to battle the beetles here and here.